It is Super Bowl week, but before we get to the big game, we have some college basketball to breakdown. Keep an eye out for plenty of Rams Patriots content coming out soon on the Awesemo.com site and as always mention make sure to stay tuned for additional announcements as we continue to add articles, videos and additional tools centered around our sports betting content. Make sure to follow our @AwesemoOdds twitter account for all the latest. This article is going to be focused on the upcoming College Basketball slate and will highlight a few DFS players that stand out, and a few potential wagers against the spread. Feel free to jump in our new Sports betting slack channel for additional information and conversation about the upcoming nights game in CBB and other sports throughout the season. 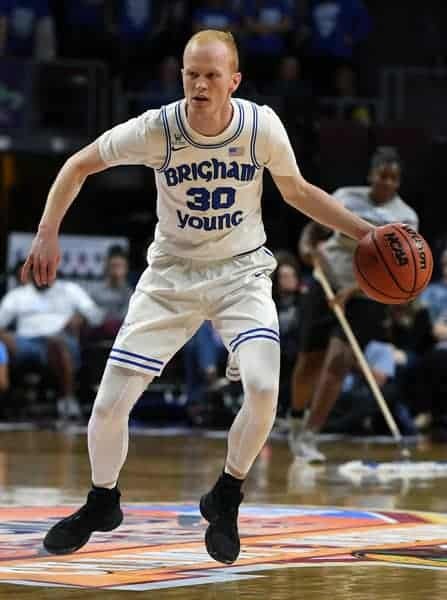 Gonzaga at BYU 11 PM EST ESPN2 – We have some late-night west coast basketball to watch as the Zags are going to Provo to play BYU, in what easily could be the biggest game on this slate lacking big marquee matchups. Gonzaga is rolling after losing 2 straight earlier in the year and hasn’t really been pushed too hard in conference play. San Francisco had them in a battle a few weeks ago but the Zags surged to a double digit win late, and other than that every other game has been a blowout as they are just too talented for most teams in the WCC. On the other side it hasn’t been a great year for BYU, who sits with a 13-9 record. Yoeli Childs leads the way on the inside for the Cougars, averaging a very solid 22.3 ppg with 9.7 boards as well. He will be dealing with Hachimura on the Gonzaga side and he 100% needs to stay out of foul trouble if BYU is going to hang around. The other key is they need to hit some 3’s and that is TJ Haws’ department. The Junior guard can get hot in a hurry and he needs to keep the Zags honest by stretching the floor and keeping them in the game for as long as possible. The spread right now is BYU +14 which shows how dominant Gonzaga has been, even when going into a hostile environment. BYU does play much better at home and is playing better overall having won 4 out of the last 5. Despite them being overmatched from a talent standpoint I would lean to the home team and think they can keep this one in the single digits and cover the 14 point spread. TJ Haws – BYU – $8100 DK – Just talked about this game, but just want to add in the O/U sits at 166 meaning we could be in for a track meet. That obviously is going to help guys from a DFS perspective and someone like Haws should really benefit. He contributes enough in assists/steals/boards to give him upside, but obviously we are after scoring when paying this tag for him. He easily should play 30+ minutes tonight and will have the green light early and often. We have seen him also use the Harden formula with a 18-22 FT effort vs Pepperdine a few games ago so he can score in a variety of ways. If BYU has any chance to compete they need Haws and if you avoid the blowout risk he is a nice starting block on this slate. Tyrique Jones – Xavier – $6100 DK – Xavier travels to Georgetown tonight in an expected close back and forth contest. Spread sits at X +3 with an O/U of 153 so another game that could have some points put up. Tyrique Jones is a guy who was an afterthought for a good amount of the season, as he wasn’t a key piece and just someone who contributed here and there. In the last 5 games he has been inserted into the starting lineup and responded with a 16.4 PPG 9.3 RPG effort, which is clearly what we are looking for once again tonight. The minutes boost obviously is a key factor and he is coming off a 37 minute effort against Marquette so it looks like he is seeing all the time he can handle. He will be tasked tonight with trying to limit Gtowns frontcourt and I think Jones still has plenty of value as his price still isn’t where it should be. Georgetown -3 – Seems like Georgetown is in a close game every single time they take the floor, and Vegas expects that again tonight vs Xavier as they are a 3 point home favorite. The Hoyas need to win these types of games especially at home if they want to find the big dance and coming off a good road win vs St Johns could be the start of a run. Freshman Mac McClung is emerging in the backcourt while Govan still mans the inside and gives G-town a nice one two punch that Xavier could have some trouble handling. These two teams did play already this year at Xavier with G-town losing 81-76 in a hard-fought battle. Xavier has lost 3 straight and although they are getting a little healthier with Goodin back I don’t think it will be enough on the road and I’ll take G-town to level the season series and cover the -3 here. Loyola Marymount -5.5 – Loyola Marymount (15-6) gets Pacific (12-10) at home tonight in a game I think they should handle somewhat easily. Their senior guard James Batemon is one of the better players you probably haven’t heard of and he should lead the charge against a Pacific team who really hasn’t taken down a quality opponent on the road the entire year. After starting the season 8-0 LMU hasn’t been as sharp lately, but most of those struggles have come on the road or against a team like Gonzaga who is just too talented. Coming home against an inferior opponent is always a recipe for success and I’ll lay the 5.5 here with the Lions.